Drew Ferguson knows he's at a crossroads in his career. He showed he's up for the challenge by coming through in the clutch for Triple-A Fresno in the playoffs. The Astros outfield prospect homered and drove in three runs in the Grizzlies' 10-1 rout of Memphis in Game 2 of the Pacific Coast League Championship Series, to even the best-of-5 Finals at one game apiece. "Of course in a five-game series, every game is an important win, but you definitely don't want to go down 0-2 and have to win three straight on the road in any playoff setting," Ferguson said. "We kind of understood that it was a must-win type of environment and I was not surprised that we came out swinging it. We haven't necessarily showed up every single game this playoffs, but we have a really talented offensive team, so I'm not surprised we came out and took it to 'em." The 26-year-old missed a significant chunk of the season after fracturing his right ulnar styloid -- the same injury Yankees outfielder Aaron Judge has been nursing -- in June. Ferguson didn't return until Aug. 27, at the end of a year he considered crucial to his development. "I don't recommend any Minor Leaguer break their wrist in the middle of an important season," Ferguson said. But the Belmont product didn't appear to miss a beat upon his return, hitting .400 with two doubles and two homers over his last seven regular-season games and posting a .375 average and a 1.099 OPS in five playoff games. "I feel pretty good at the plate, honestly; once I got that wrist back to where it needed to be," Ferguson said. "It took some time with my swing. But with the type of player I am that likes to leverage good plate discipline, it wasn't too tough to get back in the swing of things, more so than other guys that are more swing-happy and struggle picking out the good ones." 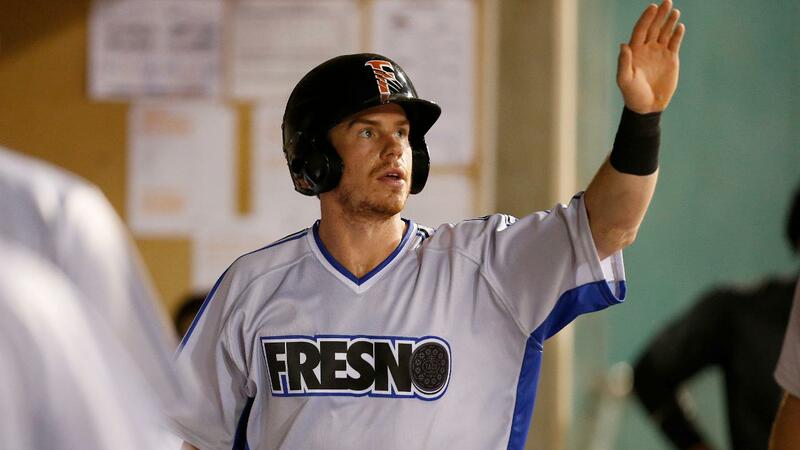 He picked out a good one Wednesday as he kicked off the scoring in a six-run second inning for Fresno by hammering a two-run homer to left field. The Grizzlies ended up batting around in the frame. "I was thinking about looking for a slider because [Memphis starter Tyler Lyons] throws quite a bit of sliders," Ferguson said. "But I kind of talked myself out of it and figured I would try and look for a fastball middle that I could do some damage on. And the pitch was right down the middle, fastball right down the middle, and I got it almost perfectly ... that's always a good feeling." Astros No. 14 prospect Myles Straw roped a ground-rule double to put the Grizzlies up, 3-0, and then second-ranked Kyle Tucker clubbed a three-run homer to right-center. Jack Mayfield whacked a solo homer in the fourth and then Ferguson plated Nick Tanielu with a RBI single to left in the seventh. Mayfield drove in Straw on an groundout and AJ Reed poked a run-scoring single to right in the eighth to cap Fresno's scoring. Cardinals No. 11 prospect Max Schrock drove in the Redbirds' lone run with fifth-ranked Andrew Knizner crossing the plate on his sacrifice fly in the third. Trent Thornton earned the win, allowing one run on six hits and two walks while fanning five over six frames. Ralph Garza, Matt Ramsey and Brendan McCurry contributed a scoreless inning of relief apiece. The Grizzlies totaled 15 hits, with every member of the lineup hitting safely and five out of the nine hitters recording multiple hits. St. Louis' No. 6 prospect Randy Arozarena and Knizner both went 2-for-4 for the Redbirds. The series pivots to Memphis for Game 3 on Friday at 7:35 p.m. ET.